How is it almost Easter?? With one of my favorite Sunday’s quickly approaching, I thought it was time I continued on our tradition of sharing song ideas for Easter. The last 3 years I have shared 5 songs for Easter because each year God leads me to different songs to share with you. After a few years of doing this, I’m having to dig a little deeper to give you songs that aren’t completely obvious or ones I’ve used before now. I have compiled some of my favorites that I hope you love too. 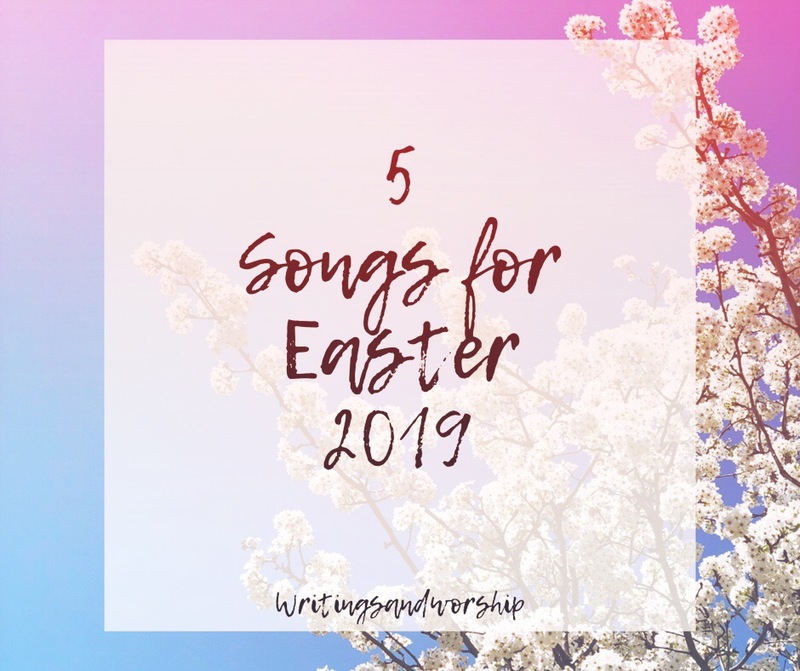 Whether you get to attend church during Easter weekend or maybe you’re unable to, I hope these songs help set your heart right for the reason we celebrate. I love to listen to songs and study verses to remind me why we celebrate- remember, as Christians, we would have no hope and no reason to believe if the resurrection hadn’t happened. But praise God! Jesus rose from the dead and we have a reason to believe. Let’s get our hearts set on the right things together. It’s not a secret that I really enjoy Elevation Worship and their music. 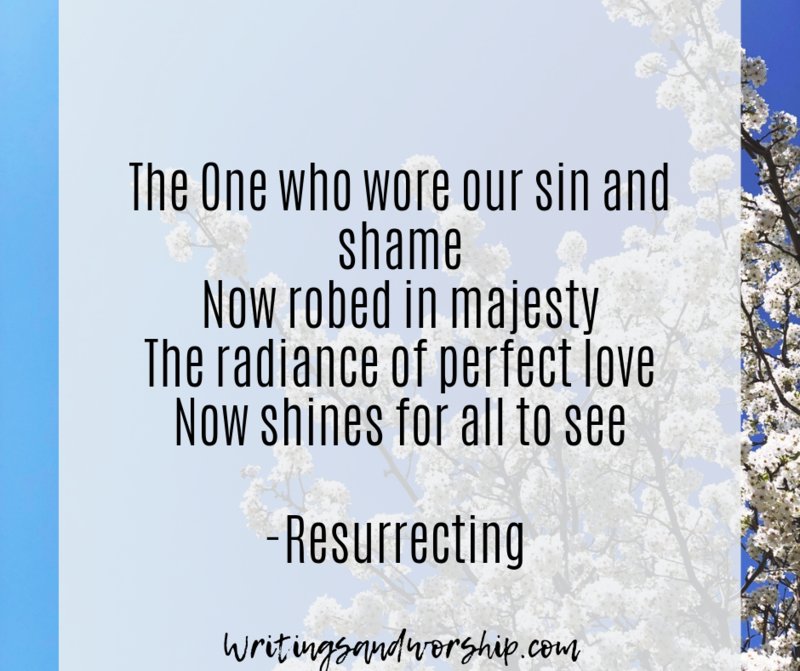 I find this song so perfect for Easter, I had to include it in the post. The whole song focuses on the resurrection so, of course, it makes for a great song too since during the Easter weekend. One thing I love is that it almost walks through the whole story of the death and resurrection of Jesus and how it ends in victory! I have a special connection to this song since my dad died. A few months ago I was listening to it and I got this beautiful picture. When my dad died, he was alone and that was always hard to handle for me. But the phrase “the resurrected King is resurrecting me” completely changed that. I now picture my dad’s spirit rising from his body as Jesus reaches down to walk him to heaven. Maybe weird to you but it brings comfort. This song is so special and such a reminder of the power and victory that Jesus’ resurrection brought. 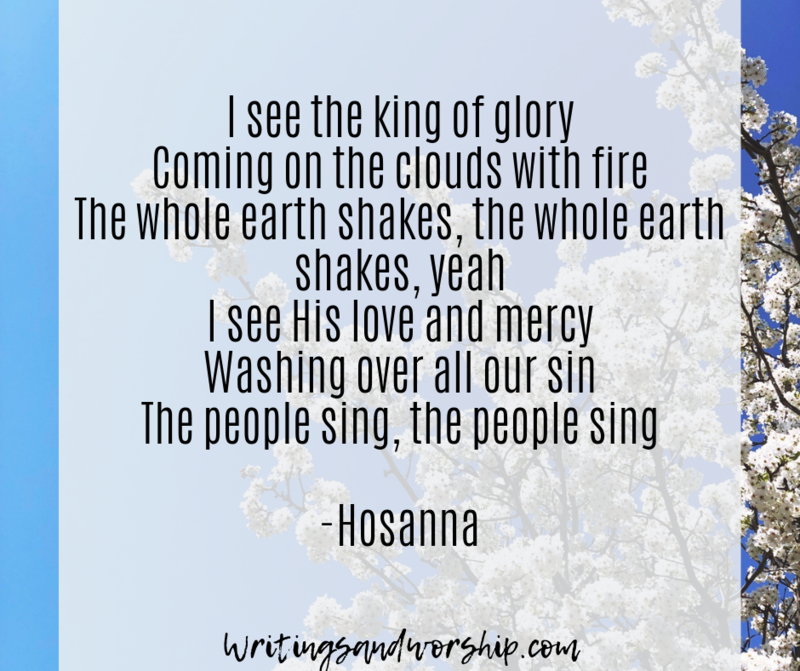 While I believe that Easter is a great time to sing songs specifically about the death and resurrection- I always love singing songs just about Gods love for us. Because remember, it was that love that brought Jesus to Earth to be a man and die for us. This song took the worship scene by storm and for good reason. It is such a powerful song. This song is all about the overwhelming and extraordinary love that God has for us. It doesn’t make sense. We will never give Him what He deserves yet He loves us anyway. The bridge is one of my favorite parts because it reminds us that God goes to great lengths to call us to Him. 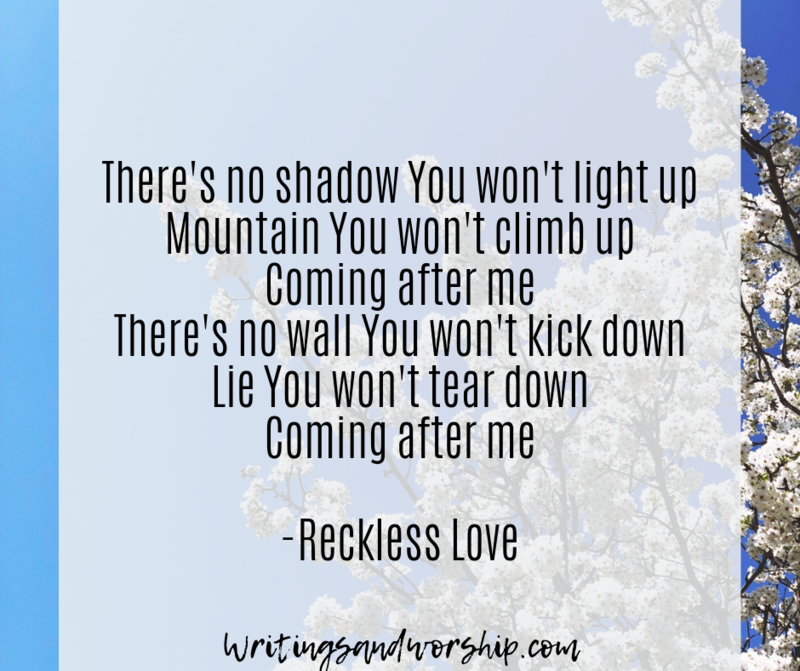 No shadows, no mountains will stand in the way of Jesus trying to get to us. Just like He left the 99 sheep to find the 1- He does the same for us. One of my lesser-known Kari Jobe favorites! I love songs like Death was Arrested, Forever, and Glorious Day but those are well-known and sometimes you might want to throw a different song in your set for Easter. This song is a catchy but powerful song that talks about how Jesus’ death and resurrection brought freedom, gave us a breakthrough, and allows for no more fear. All of that because the Savoir is here. If you enjoy more upbeat songs, this would be a great song! I love songs with good theology written into it. If you step back and really listen to this song, it’s all about when Jesus appeared to the disciples after His resurrection and right before He ascended back to Heaven. This is almost straight from Acts 1 and 2 when Jesus is telling them about how His spirit (the Holy Spirit) will come and fill them. He sent His spirit so we can fulfill our mission- to take His name to the ends of the Earth and share His name with all people. I know this song might seem a little wordy but it is packed with scripture and truth. The bridge is powerful and is asking the spirit to come and proclaiming that Jesus is alive. We should have one desire and that is to speak His name. 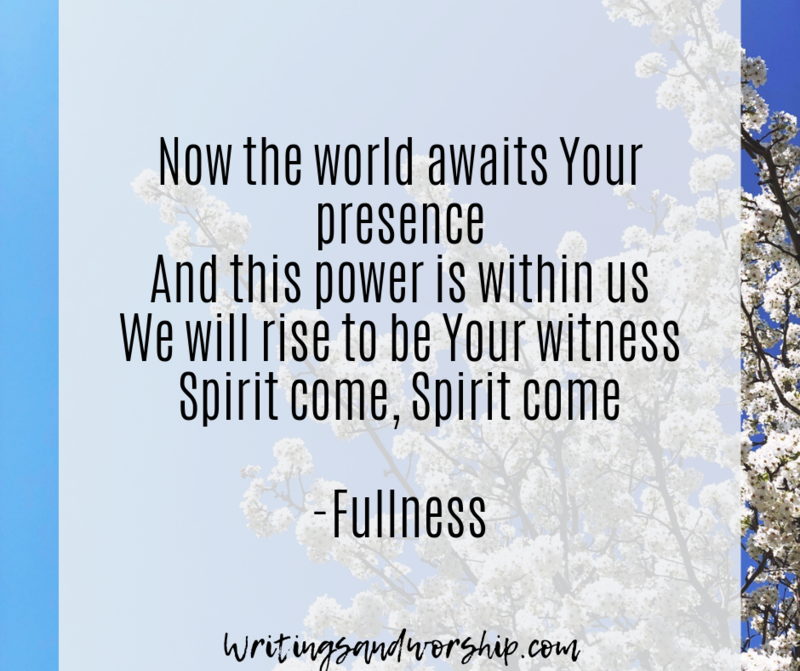 Growing up Baptist I have certain beliefs about prophecy and speaking tongues (that’s another post for another time) but I believe this song is talking about sharing Jesus. Prophesying that He will come because we know He will return. 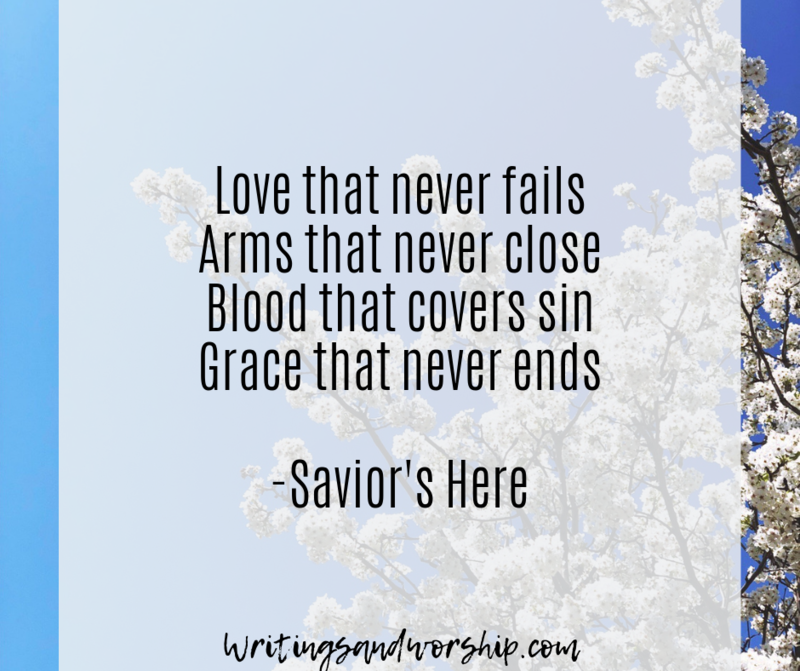 The beauty of this song is that it’s rooted in scripture- those are the best. And I love using other names for God. Remember my series of the names of God? Take a look here if you want.